It appears that you have a photo of Mantova armour B2 displayed for the front view of B1, and B4 displayed for the front view of B3. Me and my friends have replicas of milanese armour with large pauldrons. We never had any major problems exept weight. However we don't have the largest examples of milanese pauldrons that cross on the back . Just overlapping the backplate. Interesting clip and it does seem to show that swords are not ideal for armoured fighting ! Sharps wouldn't have made much difference with the armour if this was real fighting and only half-swording and pommel strikes would seem to have any chance of having some effect. Exhaustion and running out of breath would seem to cause most of the defeats has well as falling down either with help or in at least one case all by oneself. Towards the end the one with the poleaxe obviously held back from really using it because of safety reasons and ended up being rushed and pushed backwards. For a real fight " in period " I would forget the sword unless fighting a large group of unarmoured or lightly armoured opponents and go for a poleaxe or my A&A spiked mace: Just absorbing the hits from the spiked mace would not be a good option for very long but one could take sword blows all day long unless the sword found a totally unprotected area or got into the ocular. There is another type of tournament fight in our country, usually called buhurt. It is a group fight here you can use poleaxes, halberds, warhammers etc and there are very few restrictions, but there is much higher risk of injuries. It certenly looks like a bunch of fun. For those interested in more effective fighting with Swords in armour I would recomend a peek at the manuscripts on Harnishfechten. Use the sword as a small poleaxe. I can also recomend the research of Daniel Jaquet , Dierk Hagedorn and Claus Soerensen on the subject. Thanks, repaired! I knew I should double check those... Please, do tell if you find any other mistakes or if you know of any suit that's not on the list. If the armour is just there to keep you alive but the fight is simulating un-armoured combat then you guys are " suicidal " in giving and taking multiple hits when the first one would have ended the fight with a major wound or even decapitation. The problem is forgetting to be careful and try to come out of the fight un-hit and still alive with all body parts still attached to your body. Don't take this as serious criticism as what I saw was mostly having fun but there was zero play at the sword and constant detaching to hit somewhere else while leaving oneself completely open to being hit ! I keep looking and saying to myself I just wish someone fighting me would leave me all those openings ! Naturally when a subtle or even not so subtle hit is not acknowledged and the opponents keeps on fighting as if nothing would have happened then it become fighting in armour with ineffective against armour weapons while avoiding the thrusts or pommel murder strikes that would be effective with a sword. Not the same " game " but I'm looking at it as if I was trying for a simulation of real fighting and where the fight would be good training for a real fight. Seems like great fun but it also is a good way to train in bad habits that would get you killed fast if the fight was real and un-armoured. Since I train with only a fencing mask and gloves and use steel blunts we always have to keep it real using control and acknowledge near misses as if they where real hits. ( This form of no touch or very light controlled pulled hits also have their distortions but they do make one prudent and aware of suicidal double hits and a desire to avoid them ). Again, the problem is to use the armour to provide safety when hits are full power and full speed but still act as if there was no armour present: One tends to forget this and it takes constant effort to maintain the fiction that one isn't fully protected and judge the fight as if it was an un-armoured fight. Just as an example of another training technique that takes absolute honestly by both fighters is when we fight deliberately in slow motion: It very difficult to maintain 30% speed if your opponent suddenly goes to 60% speed to avoid losing since he can see the blows coming easily. But when one can maintain matched slow motion speeds this training it is very educational to do as an alternate way to train in addition to normal speed training. ( Good for paired drills " patient/agent " and to try out things and explore what works " geometrically " and try different things from the same starting points or anywhere during the exchanges ). Sorry if this is getting a little off topic with just training technique suggestions/opinions. Updated info on Klingbeil armours, found where pictures are from. No wonder I thought they were familiar - they are from Gerry Embleton's Medieval Soldier, pages 30 and 32. The private collection is not named, not even at the end in Acknowledgements, where the writer thanks to the collector for opportunity to study the items for past 10 years. We are fully aware of things that you say. We know and practice the teachings of old masters. However as I mentioned before the sparring was conducted by the rules of most tournaments here. The aim is to hit your oponent more than he hits you. None cares that you were first hitting his neck perfectly when he crushes you with 2-3 hits a second after.You lose. It is more a sport, not a reconstruction of a battle. It's more like a boxing match. And this training is optimized to win such a duel, not recreateing anything. I don't really I like it, but when you go on an event, you have to follow the rules of the organizer. Sometimes the prize for winning the tournament is higher than the average month salary, and there are some fighters that specialise in winnig them They armour is reduced to the minimum, in fact far below to be really efective in real fight. But it protects against blunt blows. And its very light. As a comparison take a look at some of the best fighters in our country. Agreed this subject might make a good new Topic but it does distract from the Topic. Very, briefly: I understand what you mean and the rules for the game which is not designed as period training. ( Stopping now before I go on and on and on as I tend to do. ). Spent a few days organising photos for the list of German Gothic armours. Now that's an eye opener, more than 40 suits! Well, some of them are really doubtful or labelled as reproductions by some. I also found some new Italian ones I will be adding here, I just hope I still have enough space for the extra photos - I should have added an empty post after the list for future expansion. Of course, there are more museums, but I cannot recall any of them having armour in such quantity as the above four. This thread has been a vary nice presentation of some interesting information. I appreciate everyone's efforts in creating and populating it. thank you for this great post. Have you made a gothic armor thread yet? You could always ask an admin to insert a post for you to expand in this thread also. do you have any more photos of the ulrich armor? The bascinet with frog mouthed visor is very interesting and something ide like to replicate. This looks like the basis for Jefferey Hedgecock's tourney helm. What is the purpose of the huge "wings" on the back of some of the pauldrons. I noticed that they acually overlap on some of the armours. Has anyone tried that large pauldrons for figthing? thank you for this great post. Have you made a gothic armor thread yet? 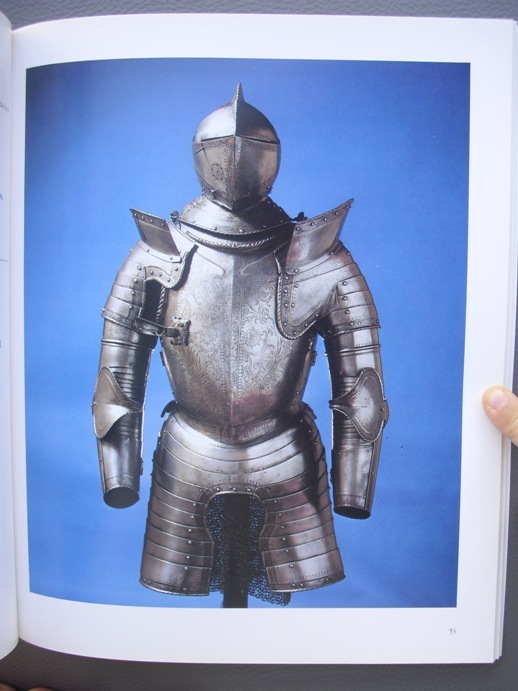 Try here: Extant 15th Century German Gothic Armour. i have two sets of milanese armour, one with the large overlapping pauldrons. I have never worn it however, Im out of state until the 8th of Dec. but when i return ill try out the cuirass to see if the overlapping plates snag. ill post some pictures and post range of motion results. I just picked up my set of overlapping milanese pauldrons in Pontoise (Fr), I'm currently adjusting my shoulders straps on the gambeson. Once thats done i'll throw on my cuirass, arms & pauldrons. I'll take some pictures once i have completed the adjustments. I'm not sure how well the articulation should be, but in the current state of assembling the kit on the gambeson i think some grips such an Ox will be near impossible because of the limited room on the left hand side. This might be down to the measurements on the set being off, the left side of the armour currently has some issues where the pauldron's extra plate (guardbrace ?) and the big elbow piece (vambrace?) have little room between them and slide into each other. So far i have had no trouble with the backside locking but that might change once i have the 2nd pauldron where i want it. EDIT: Gah i forgot the most important bit, thanks Blaz for a great source of information!